Washing hanging on a line in a storm, rotating windmills, sheep and people bracing themselves against a gust, ruffled grass dancing in the wind. Dustmen, beach walkers, bathing children, families with sledges, young women on their way to work. Cars parked on the side of the road, the industrial port by night, early-morning joggers, a bicycle that leans at the side of a walkway. 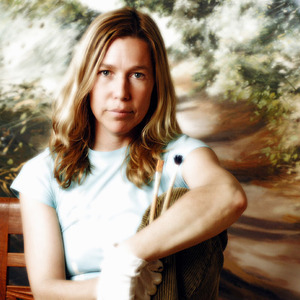 Motif sequences determine Susanne Wind’s creative process. After her art studies, she focused for many years on plein air painting – in Mallorca, Denmark and North Germany. It was only when she moved to Pennsylvania, USA, that she began working in a studio. Born in Hamburg, she returned to her hometown in 2003 and set up her studio in the creative hub that is Hamburg-Ottensen. It is apparent in her pictures that painting en plein air was the starting point of her artistic development: her motifs still now originate from the outside world – she does not set them up, but uncovers them. Her brushstroke is swift and spirited. She places lots of emphasis on light, which has always played a major role in all plein air painting. Locally, outdoors, it’s not painting or sketches that evolve, but photographs. With her camera, she goes on exploration tours – often in the early hours of the morning. As a silent observer, she captures the light as it makes its way through the trees, pervades the countryside and is reflected in car bodies, the wind as it ruffles up grass, dandelions and buttercups as they spread across bicycle paths, trees growing into traffic light intersections, cafés and streets awakening to life, people beginning their day. These photographs then become part of her archive of motifs – as inspirations and later often as templates for her paintings. She mixes the colours in the studio with colouring pigments, linseed oil, turpentine, resin and egg and then brings her themes onto canvas. Already captured in photos, elaborated on – through brushstroke and light, transparent colours – through her painting, her pictures then hold much more than simple atmospheric appeal. They inspire thoughts and feelings. They cause people to hold for a moment in appreciation of the beauty in life. Susanne Wind paints the force of nature that overgrows everything it can. She paints the energy of light that allows us to guess at spiritual spheres. And she paints children’s abandon at the full sense of freedom of being as they leap from a dune.